Unfortunately, due to massive flooding, this weekend’s home opener versus Wichita has been cancelled. The GOATS will be on road at the Wayne tournament in South Sioux City on April 6th. Their next home match will be on April 20th versus old time rival KCRFC. The home schedule features a match against the always tough Wichita and an old D2 rival in the Kansas City Rugby Football Club. The GOATS will tour to South Sioux City and Iowa Falls for their spring tournaments. They’ll cap the season traveling to Iowa City for a league make-up and friendly against division foe Iowa City Ducks. Thanks to everyone who joined in on the fun and to those helped plan the event. Special thanks to GOATS alum and long time sponsor Barry O’Halloran for hosting us at Barry O’s Tavern and helping us kick the party off right! 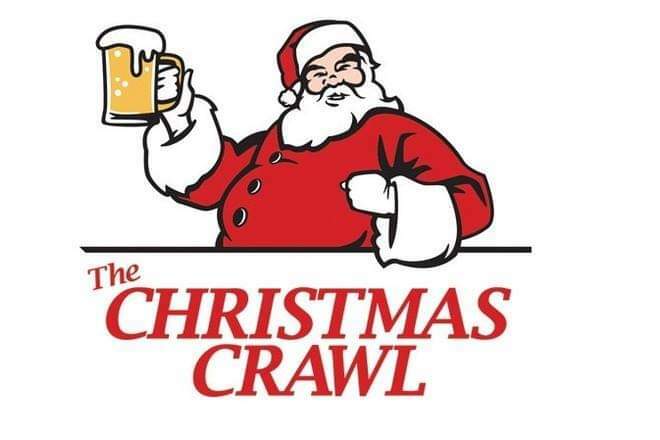 This coming Friday, the GOATS will be hosting their end of the year member pub crawl to celebrate the 2018 seasons of GOATS rugby. No matter how the rugby goes, we’ll always win the 3rd half! Click on the link below if you are interested in joining us, family and guys interested in playing with us in the future are welcome! It’s a great time to get to know us and our club. 21 and over only. Omaha traveled to the east side of Iowa to take on Clinton Muddy River Football Club. Clinton showed up to their home match with a full, tough side while Omaha were only able to bring 13 men across the state for the river city rivalry. The 15 on 13 advantage for Clinton proved to be a huge difference for the entirety of the match. Clinton began the scoring and didn’t see an answer from Omaha for most of the first half until Will Landolt dotted one down in the corner for the visitors. That would prove to be Omaha’s only score of the game, and Clinton would continue the onslaught until the final whistle with the final being 65-5 to the home side. With the cards stacked against them, the Omaha GOATS still proved to be a physically tough opponent. For the next two weeks, the GOATS have some much needed home matches versus Des Moines and Bremer County on October 6th and 13th respectively. We hope to see many of you there for some hard hitting rugby fun in addition to our Hunger Heroes Food Drive! Be sure to bring boxed and canned goods or any other non-perishable items, as we’ll continue our food drive with the Open Door Mission to combat hunger in Omaha! For the second straight weekend, Creighton University and the University of Nebraska-Omaha squared off at Storz Rugby Complex in North Omaha for “The Dodge St. Rivalry”. In the first meeting on September 22nd, UNO handled Creighton by a score of 37-8. This weekend’s match proved to be much more competitive, with both teams playing with sound fundamentals on a cold, wet playing field. UNO started the scoring and seemed to be pulling away when Creighton found an answer through their pick and go game, which opened the field for their back line. But UNO was able to maintain possession late and the final ended with a score of 27-17, the Mavericks over the Jays. Last spring, it was Creighton who was dominant against the UNO side, winning 24-10 in their first match against one another in years. The UNO club was on hiatus for a few years, but now seems to be as strong as ever. They have a heavy GOATS presence supporting them. UNO was able to reform last year with the help of not only several dedicated student leaders with rugby experience, but also GOATS old boy Tom Beers as coach. Since then, the torch has been passed on to Kyle Cihal, also a GOATS old boy. Several of the UNO collegiate players play with the GOATS 7s team in the summer as well and bring great knowledge and passion to their program. And although you may not know it, Creighton has been a steady, knowledgeable rugby presence in Omaha for decades. During their nationals run a few years back, the Omaha GOATS were made up of many Creighton alumni. As of now, Creighton is a student-led organization that are governing and coaching themselves extremely well. Some of their members put the UNO rivalry aside in the summer and play with GOATS 7s team as well. The GOATS have a small role in the current Creighton squad, as Danny Walsh, a GOATS old boy and past board member, serves as their Faculty/Staff Moderator for the club and coaches when available. Both Creighton and UNO have a few more matches left in their fall season, including some home matches at Storz, and look to build on their successes thus far. Check them out on their websites and social media sites. Jordan Frost distributes the ball to the GOATS backline after a penalty. Omaha played host for the first time this season to the division leading Iowa City Ducks. The Ducks lived up to their reputation as the hard hitting division leader, and jumped out to a quick lead in the 4th minute. The GOATS tightened up their defense, but were unable to come up with an offensive answer, and the Ducks would score again in the 35th and 38th minute, leading 21-0 at half. The Ducks took advantage of some key injuries and tired legs on the GOATS side in the 2nd half, and the visitors pulled further away. The GOATS were able to dot down two tries late in the game by Jeremy Eaves and Jaco Visser, and the final whistle would give the victory to the visiting Ducks 61-12. The GOATS get a much needed bye week to rest, but will be on the road the following week to play Clinton Muddy River in Clinton, IA. Omaha traveled to rival Des Moines Saturday, where the weather was picture perfect at kickoff. Omaha struck first after Des Moines committed a penalty in the ruck, and Andy Markham split the posts to put Omaha up 3-0. Des Moines pinned Omaha deep in their territory, and were able to capitalize after an Omaha turnover making the score 5-3. Shortly after, a Des Moines defender jumped an Omaha pass and took it in for an easy score and conversion. Omaha answered with another penalty kick by Andy Markham struck beautifully from a tough angle against the wind. Des Moines responded with another turnover off set-piece and their winger showed some speed and footy skills down the sideline and touched it down for the home team. After a few too many high tackle issues, Omaha saw themselves go down a man for 10 minutes with Jaco Visser visiting the sin bin. Des Moines was able to expose the mismatch and score, but Omaha answered once Visser came back on the pitch with a try of his own. Due to several stoppages for blood subs and other injuries, Des Moines was able to dot one more down on an unfortunate bounce of the ball before the end of the long half. Omaha went into the half trailing 11-31. The second half proved to be too much for the visiting GOATS, and Des Moines made the most of their depth and brought in a lot of fresh legs. After a couple of unfortunate injuries and another yellow by Omaha, Des Moines was able to score a few more and keep the GOATS out of the endzone. When the final whistle blew, the score was 11-50 favoring the home side. Despite the score, a few unlucky bounces of the ball and a couple miscues made a large difference, and the GOATS left having played a physical and hard fought match. Omaha will look to right the ship next week with their first home match against the division leading Iowa City Ducks at Storz Rugby Complex. The Omaha GOATS RFC traveled up to scenic Decorah, Iowa this labor day weekend to face their first opponent in Division 3 Iowa, the Northeast Iowa Rugby Barbarians. It was a rainy morning, but the clouds cleared and made for a hot, humid, yet beautiful day for rugby. The GOATS came out flat and NEIA capitalized with three tries quick tries. With frustrations beginning to build, the GOATS committed two back to back yellow cards, leaving a 15 on 13 advantage to NEIA. The GOATS defensive stiffened, but still allowed another try to the home side and Omaha went into the half trailing by 24. When the 2nd half started, the GOATS came out determined and drove down the field. Andy Markham scored a thunderous try for Omaha's first score of the season, dragging a few NEIA players along with him. Soon after, Dalton Beam sliced through the defense and dotted it down between the posts, and Jake Byorth added a conversion to bring the score within 12. The GOATS continued the offensive with a late try by Greg Woodin with a beautiful assist by Beam, and Woodin added a quick conversion to make the score 24-19. Omaha failed to maintain possession off the kickoff and the ensuing plays and the score remained with a 5 point difference to NEIA at the final whistle. Omaha looks to build off their successful second half and take that momentum into their match at Des Moines Rugby next Saturday at 1 pm. Our annual GOATS Rugby Golf Outing is one of our largest social and sponsorship events of the year. 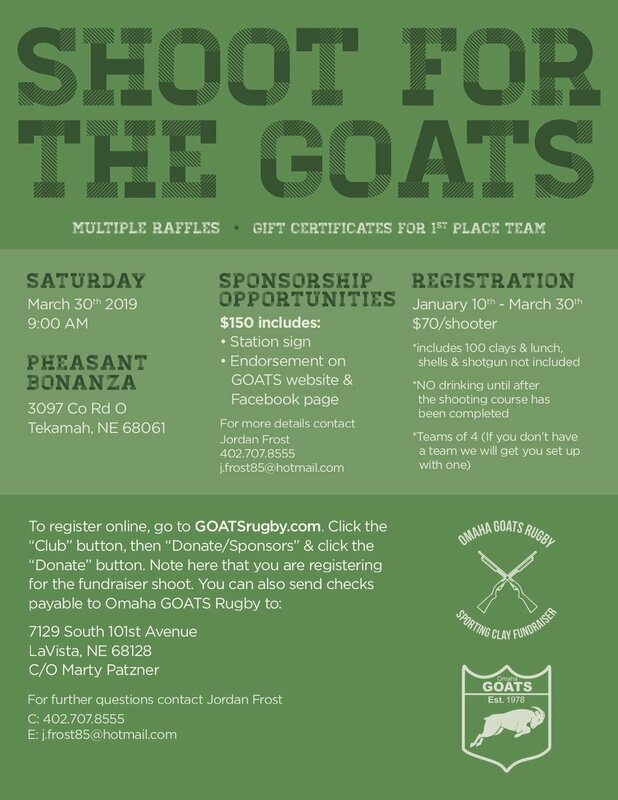 You do not need to be a GOATS Rugby member to play in this tournament. Registration begins at 7 am on August 25th at The Knolls Golf Course, but don't wait to put your foursome together! Call ahead and get your team of misfits and 'golf pros' together for a day of sport and fellowship. If you or someone you may know would be interested in sponsoring a tee, green or entire hole, contact Marty Patzner. See the flyer for more details!